Originator: Sir William Macarthur, Camden Park Estate, New South Wales, first listed the Australian Botanical & Horticultural Gazette in 1849, although without description. Photograph: Taken in E.G. Waterhouse National Camellia Garden Sydney, 2010, Dr Stephen Utick. Commentary: Dr Stephen Utick, Australia, 2013. Cassandra is recognised as one of Australia’s heritage camellias. In Macarthur’s 1850 notebook, it is recorded as ‘Scarlet crimson, four rows of outer petals, inner petals small and crowded with a few white amongst kernel. Pretty flower, with few anthers.’ A later entry for 1851 notes it as ‘Very large size.’ Professor E.G. 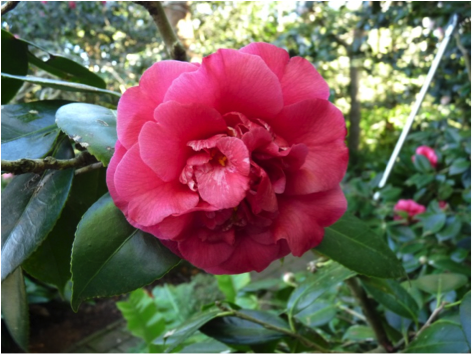 Waterhouse in Camellia Quest (Ure Smith, 1947, pages 17-18) noted an incorrect name ‘Chandlerii Magniflora’ given to this cultivar that should be discarded. The cultivar also features in Stirling Macoboy’s What Camellia is That? (Lansdowne, 1997, p.79). Cassandra is currently being conserved under Australia’s Camellia Ark project. In Camellia Quest, Waterhouse recorded a specimen growing at Camden Park and another at the Director’s residence in the Melbourne Botanic Gardens. Since then, the original Camden Park specimen has died but was replaced with a new plant. At least two specimens have been now been located in the Melbourne Botanic Gardens. Two good specimens can also be now found in Sydney public gardens, the older (circa 60 years old) at Lisgar Gardens, Hornsby, and a younger, smaller specimen (circa 40 years old) at the E. G. Waterhouse National Camellia Garden, Caringbah (the above photograph is taken from this latter specimen).